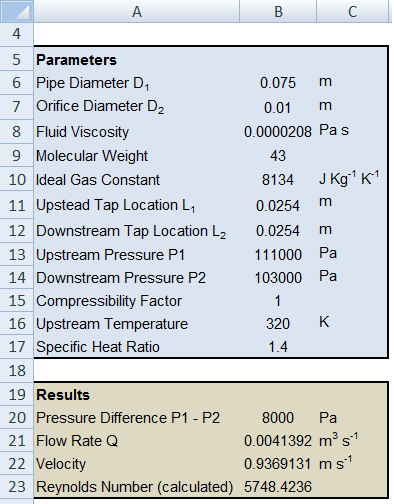 This Excel spreadsheet calculates the flowrate from the pressure drop across a gas orifice meter with the equations defined in ISO 5167. Orifice meters use the pressure loss across a constriction (that is, the orifice plate) in a pipe to determine the flowrate. While orifice meters are cost effective, they have several disadvantages. and high Reynolds numbers (>104) are required for the greatest confidence in their accuracy, and the resulting pressure drop can be significant. Accordingly, orifice meters are only used with the pressure drop is not critical, and accuracy is around 2% at best. 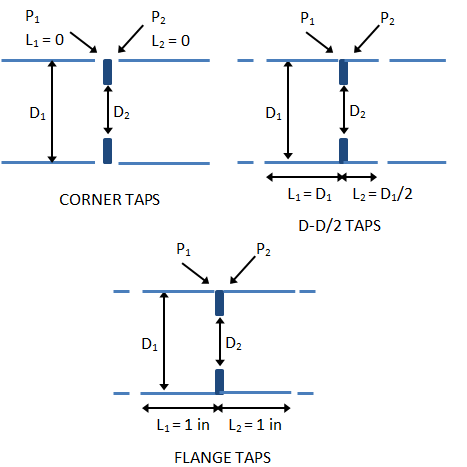 There are three standard tap positions that determine the values of L1 and L2, as illustrated below. 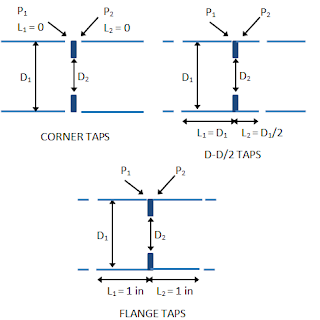 For corner taps, L1 = L2= 0, for D-D/2 taps L1 = D1 and L2= D1/2, and for flange taps L1 = L2= 1 inch. 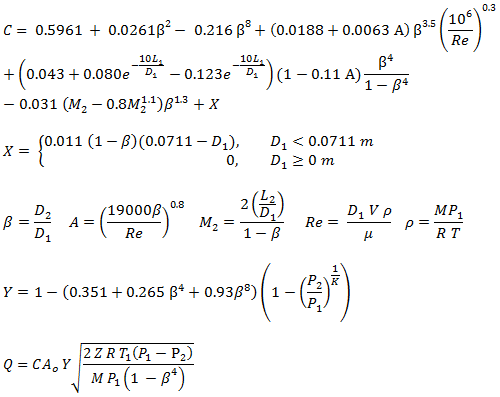 The equations use the ideal gas law to calculate the gas density (you could override this with your own value), and are only valid for pipes with internal diameters from 50 mm to 1000 mm, and for pressure ratios greater than 0.75. This is a screen grab of part of the spreadsheet. The spreadsheet provides an initial guess value for Re. This is used to calculate C and V. V is then used to calculate Re. Excel's Goal Seek varies the guess value of Re until it matches the calculated value of Re. 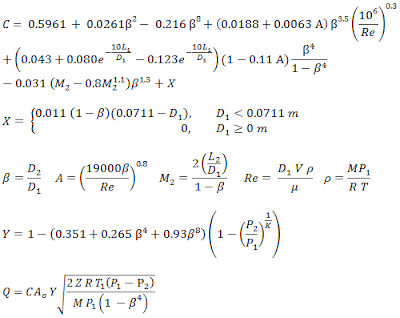 By carefuly altering the equations (and the parameters used by Goal Seek), you could also solve for any other variable - for example, you could find the pressure drop for a specific flowrate (let me know if you need help in implementing this). You'll find a spreadsheet that models a liquid orifice meter here. Visit http://excelcalculations.blogspot.com regularly for more free engineering spreadsheets. The equation you have used to calculate the flowrate in Gas Orifice Meter excel sheet is different then the one mentioned in the ISO 5167-2 2003. Also discharge coefficient equation is different then the one in ISO 5167-2 2003. Please can clarify? I can send you a copy of ISO 5167-2 2003 if you need. Could you send me a copy of ISO 5167-2 2003? I've lost my copy so I can't double-check. Keep up the good work. I however spotted some minor errors.The first is in the tap positions for flanged tapping. I noticed you have put L1=L2=1 (I presume this is in inches). In the ISO standard, the correct thing stated there is L1=L2=1/D, where D is the pipe internal diameter in inches. I would also like to point out that the equation you used for expansion factor Y is different from that stated in ISO, although they give very close results. While on that subject, can I ask if you know the correct equation for expansion factor to use if my pressure ratio exceeds 0.75?. Thanks once again for the good work.